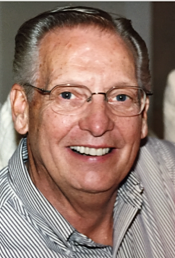 Surrounded by his family and sweetheart, Ron peacefully passed away on April 14, 2018 in Mesa, Arizona. Ron was born April 23, 1934 in Paducah, Kentucky to Aubrey Morgan and Lois Inez Cooper McDaniel. El Paso, Texas became home in 1946 where he lived for 58 years. He attended Ysleta High School (Class of 1952) and met the love of his life Charlleene Arrott. They were united in marriage in 1953. Ron was drafted into the US Army in 1958 and later graduated from Texas Western College (UTEP) in 1961. He was employed by KROD/KDBC-TV for many years. While in El Paso he was an active part of the Sun Bowl Committee, the El Paso Zoological Society, Yucca Council- Boy Scouts of America, National Conference of Christians and Jews, El Paso Athletic Hall of Fame, and Downtown Lions Club. Ron was a Lifetime Member of the UTEP Alumni Association and El Paso Jaycees. In 1970 Ron was honored as El Paso Outstanding Young Man. Ron was a faithful member of the Church of Jesus Christ of Latter-day Saints where he served in various callings, but the most memorable was Scout Master for Troop 38. Many of his scouts earned Eagle recognition and Ron was later presented the Silver Beaver Award. Ron was preceded in death by his parents, a brother Bobby Morgan McDaniel and grandson Daniel Joseph Flores. He leaves behind his high school sweetheart of 64 years Charlleene, 6 children: Ella Romney (Brent), Charla McDaniel, Ronda Hutchins (Norman), Lisa Robalin (Brad), Ron McDaniel (Shauna), and Cyndi Bowers (Mark), 30 grandchildren and 24 great grandchildren. Ron is also survived by his brother Bill Don (Kelly) McDaniel and numerous nieces, nephews, extended family members and dear friends. The family extends their sincere appreciation to Serenity Hospice and caretakers Anthony, Chelsea and Angie for their gentleness, kindness and the compassion shown to our parents. Service for Ron will be Thursday, April 19, 2018 at 10:00 AM @ The Church of Jesus Christ of Latter-Day Saints Stake Center, 1550 N. Val Vista Dr., Mesa, Arizona. Burial will take place in the beautiful mountains of Alpine, Az. In lieu of flowers, please make contributions to the LDS Humanitarian Fund found at: www.ldsphilanthropies.org/humanitatianservices. We will always remember Ron’s twinkle in his eyes, his beautiful smile, and his loving and friendly personality. May his memory be forever a blessing. I know you all are overwhelmed with family and friends of Pops wanting to reach out and love you. We as well pray for peace and understanding as you face your days without him. His plan is sure and what a future Pops is enjoying in Glory. Love you all. Thank you for the companionship and love through all the years, no matter what. I love you with al my heart. My prayers are with all of you and I am there in Spirit. Ron and I met in college 60 years ago. Our relationship at the beginning, mostly consisted of seeing each other on campus although we did see each other occasionally at our railroad jobs. About 41 years ago, Ron introduced Guille (who became the love of my life) to me. We both are forever grateful for that introduction. Our friendship became stronger over the years and while we did not always agree on things, we never had a falling-out. Ron’s devotion to his family and faith set a great example for me. Looking at the McDaniel family today, Ron was indeed a wealthy man. While I write this with tears in my eyes, I rejoice in knowing that Ron’s earthly frailties are at an end and that he is living the true life that we all aspire to live. Ron, I miss you already, I will see you again, I love you and thanks for being my closest friend all these years. I thank all the McDaniels for sharing their time with Ron with me. His time with me, especially in the last few years, meant a great deal to me. God bless Ron and all the McDaniel family.